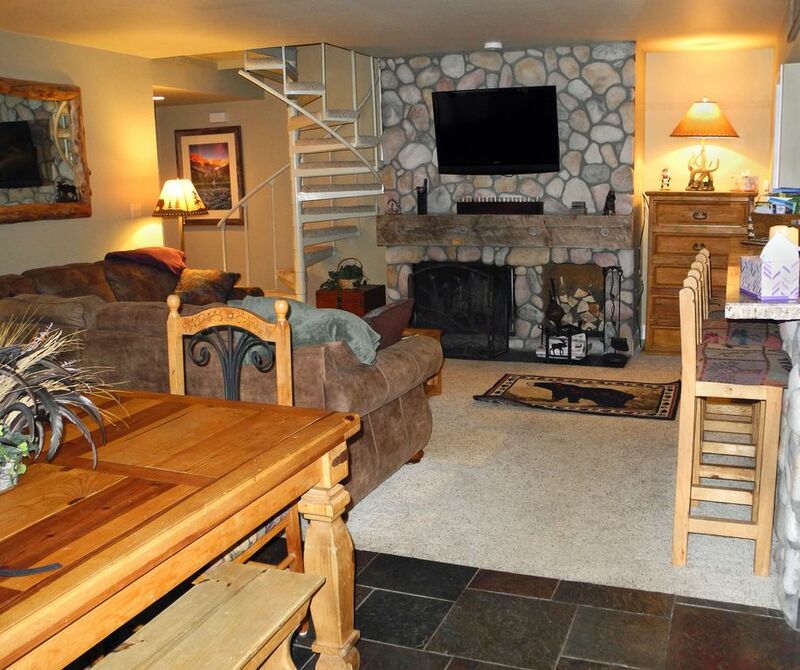 This beautiful 2 bedroom +loft condo is located in a quiet wooded setting just 1.3 miles from the base of the Keystone ski area lifts. The free Keystone shuttle bus is a 3 minute ride that leaves every 20 min. and is just steps from your door. There are also shuttles to Arapahoe Basin and Breckenridge ski areas. You can be at Copper Mtn. in 15 minutes or Vail in 30 minutes by car. The Keystone area is a recreation wonderland with every possible summer and winter activity at your doorstep. The entire 1,111 sq.ft. unit has been newly remodeled with tile floors, granite counter tops, tiled bathrooms, stainless steel appliances, and new furniture. We recently added a new and very comfortable sectional sofa to increase the seating in the living room. New carpet in the entire unit! The master and guest bedrooms have queen beds with luxurious memory foam mattresses. The kids will love the upstairs loft with its twin beds, bunk beds, and a TV for videos. The upstairs loft is not well suited for 4 adults so I do limit the guest to no more than 6 adults. Each bedroom and the living room have cable TV with free HBO. The wood burning fireplace will help keep you warm and add a real winter vacation atmosphere. A large private ski locker is located just outside the unit so you don't have to carry your skis inside. New 50" High Definition Flat Screen TV just installed in living room! The Flying Dutchman complex is beautifully maintained and easily located just off the main highway. The outdoor pool is heated and is open all year. There is a hot tub and sauna in the clubhouse. All units have free wireless high speed internet. Sorry but smoking is not allowed in this unit. We are a skiing family. My wife and I volunteered with the National Ski Patrol for 25 years. We love to spend time in the mountains all year round. We loved the quiet setting away from the main resort area but it was still close enough to walk there in the summers and just a short shuttle bus ride in the winter. Wonderful location for skiing, hiking, biking, and other major attractions all year round. It has a great pool and indoor hot tub. Coin operated and just steps from the condo across the hall. Wonderful plush towels. Separate towels provided for pool. Very well equipped with anything that you will need. Nice family selection of games. Beautiful lawn and garden areas for photos and games. On Keystone shuttle bus route. Ski storage lockers provided in hall. Two championship golf courses just minutes away. Hair dryers in bathrooms, alarm clocks in bedrooms, kitchen is fully equipped. Great home away from home! We loved the proximity to the ski areas. Easy in and out, perfect base camp for skiing adventures. Plenty of room for our family of four. We really appreciated the fully stocked kitchen, it was by far the best stocked of any condo we've ever rented. Also appreciated the laundry facilities being right around the corner, and the pool being just a short walk away. We'd love to stay again and would recommend this property to anyone! Thanks for the hospitality. We had a wonderful stay at this condo. The condo was very spacious with a warm cozy feel. We had over 4 feet of snow during our stay, and the wonderful gas fireplace kept us warm. Nice indoor hot tub nearby. Great kitchen. Close to bus stop for skiing and restaurants. We highly recommend this place. Exceeded our expectations! Comfortable, nicely decorated, and great location! We had an amazing week in Keystone.. Jim's condo was perfect! Spacious and cozy all at once.. Nicely decorated, and just felt like home in the mountains.. Great proximity to the pool and jacuzzi.. I made the 50 second walk every evening after skiing.. Bus stop to the base of the mountain is about the same walking distance, and the bus ride was less than 6 minutes..
We were 100% satisfied, and hope to visit Keystone and stay at Jim's condo again. Three minute drive to drop off skiers is super convenient. Shuttle service is another great option, just a short walk from condo for pick up. Unbeatable location. Well stocked kitchen. Easy access to ski lifts. Rates are subject to change until reservation is confirmed. Full refund if reservation is cancelled prior to 30 days before arrival. 50% of rental rate refunded within 30 days. No cleaning charges. Deposit is refunded within 7 days of departure and confirmed by email.